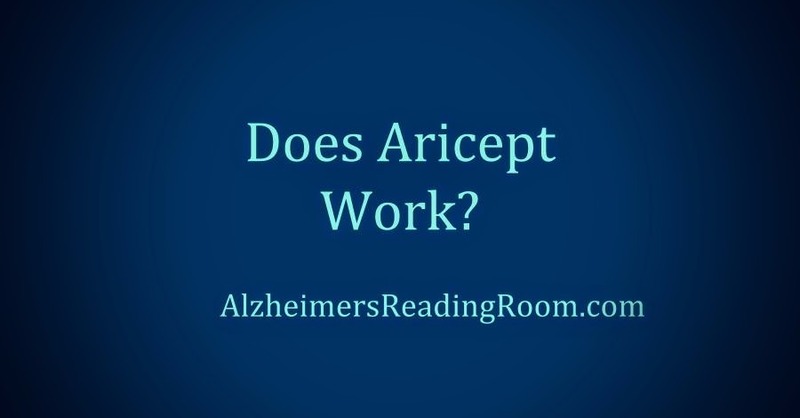 I cannot remember how many times I have been asked, Does Aricept Work? Does Aricept work, did it work for you mother, Dotty? Aricept is the brand name for the drug Donepezil. Donepezil is marketed under the trade name Aricept by its developer Eisai and partner Pfizer (PFE). Donepezil is now available as a generic. And, the price of Aricept via the generic Donepezil has dropped by more than 90 percent. You can now purchase a 12 month supply of the drug for just over $100. Here is what Robert Howard had to say about this recent study of Aricept, Donepezil and Memantine for Moderate to Severe Alzheimer's Disease. For the first time, we have robust and compelling evidence that treatment with these drugs can continue to help patients at the later, more severe stages of the disease. We observed that patients who continued taking donepezil were better able to remember, understand, communicate and perform daily tasks for at least a year longer than those who stopped taking the drugs. The key words here are "at later, more severe stages of the disease". 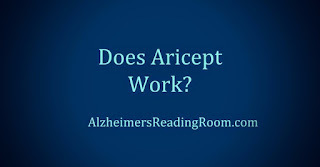 Aricept is approved by the FDA for early to moderate Alzheimer's disease. Now to the question, Does Aricept work? I believe the drug did work very well for Dotty. For certain, her mood and behavior changed about 4 to 6 weeks after she started taking Aricept. I believe it helped slow the decline in her memory. However, I cannot say that with any certainty because I have no way of knowing what her memory would have been like without Aricept. I should add, when we were adding Aricept, we were also undergoing a series of lifestyle changes. For example, I took Dotty into a gym for the first time when she was 87 years old. No doubt exercise made a difference. We also moved to a Mediterranean diet, began going to the Banana Boat, and started introducing more bright light into every day. So, while I remain convinced that Aricept did and does work for us, I think the combination I just described above is helpful if you want to to get a good result. There is no doubt that some patients have trouble tolerating the drug. However, in some of these cases I learned that some patients are put on 10 mg of Aricept on day one. This is not the recommended dosage. The patient should be put on 5 mg to start. I am not a doctor, but I would suggest at least 4 weeks at 5 mg. We actually went 6 weeks at 5 mg, before moving up to 10. Another thing I learned is that some caregivers expect an immediate positive impact from Aricept. They also have an expectation that Aricept will improve memory. For most patients, these are unrealistic expectations. You have to give Aricept a chance, and you should remember that since you can't take a test, like a cholesterol test, you can't make a good comparison to what is, what was, and what might have been. I am not a doctor. I am a caregiver just like most of our readers. So think of me here is another caregiver you are talking too. Many patients don't seem to tolerate Aricept well. However, I learned in many discussions that caregivers tend to give up after a few days or a week if things don't go well. I am not giving any advice here, but I would suggest you ask a neurologists, with lots of experience with dementia patients, if there is any chance that the patient will be able to tolerate the drug if you keep trying for a longer period of time. I can say, that it appears that Aricept works for some patients. We have a lot of those patients and their caregivers here on the ARR. I also know that many people could not afford Aricept. This has changed. You can buy a 90 day supply right now for under $28. I hope that more caregivers will read, Donepezil and Memantine for Moderate to Severe Alzheimer's Disease carefully. Perhaps you can still benefit from Aricept. If you have questions, or doubts, please consider taking the article into support groups for discussion. Better yet, print it out and take it to your doctor for discussion. Does Aricept work? I think it can and I beleive it did for us. Dotty is currently on the combination of Donepezil and Namenda. Bob DeMarco is the Founder of the Alzheimer's Reading Room (ARR). Bob is a recognized expert, writer, speaker, and influencer in the Alzheimer's and Dementia Community worldwide. The ARR Knowledge Base contains more than 5,000 articles, and 672,000 links on the Internet. Bob lives in Delray Beach, FL.